It is evident that people are hungry to learn about China. People are keen to be able to communicate with the 1.3 billion people. Yet there is not much out there to enable them to do so. Whilst the entire Chinese population is learning English, the West is struggling to comprehend this complex economy and society with their own eyes and judgment. Knowing their language is the key towards true understanding. ShaoLan Hsueh – an inspiring entrepreneur, creator and author has built Chineasy into one of the most popular methods of learning Chinese across social media and the Internet in less than one year. 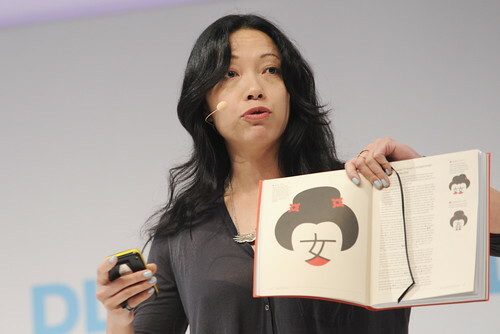 Chineasy represents a return for ShaoLan to her artistic upbringing and in many ways also an arts project. This project is the culmination of her life's journey between traditional and modern, technology and design, as well as through the East and West. Join ShaoLan to know how she unlocks the complex of Chinese language and her ambition to shape the new way of learning. Her innovative Chineasy project will show you that how she gives the West a real understanding and knowledge of China and Chinese culture through their own eyes rather than through layers of packaging, manipulation or loss in translation. Finally, she will be demonstrating the beauty of this deep and broad culture through a modern interpretation using sleek and simple design. This workshop is part of the DLDw14 learning conference and will take place on July 22nd at 12pm. Do not hesitate to contact us if you had any questions and apply to attend DLDwomen 2014 here.